The Boeing 717 is a jet airliner. It has two engines, which means that it is a twinjet. It also only has two rows of seats, which makes it a narrow-body plane. The Boeing 717 was designed and sold by McDonnell Douglas. It was called the MD-95, which was designed from the DC-9. The 717 can hold up to 117 passengers. It can fly for 2,060 nautical miles (3,820 kilometres). The 717 has two Rolls-Royce BR715 turbofan engines. The first MD-95 was ordered in October 1995. Boeing bought McDonnell Douglas in 1997, which was before the first MD-95 was made. 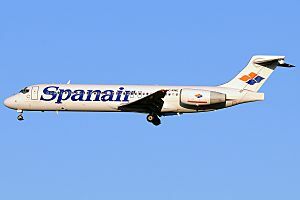 The first plane was finished in 1999, and it was called the Boeing 717. Boeing stopped making 717s in May 2006. 156 were made. Douglas Aircraft made their DC-9 to fly with the DC-8 in the early 1960s. The DC-9 was a brand new design. It had two Pratt & Whitney JT8D turbofan engines at the back of the plane and a small wing. The DC-9 first flew in 1965. Airlines began to use it later that year. 976 DC-9s were made. The McDonnell Douglas MD-80 series was finished in 1980. The MD-80 was the second family of DC-9. It was a longer version of the DC-9-50, and it had more fuel and new engines. Nearly 1,200 MD-80s were made from 1980 to 1999. The MD-90 was designed from the MD-80 series. It first flew in 1993. 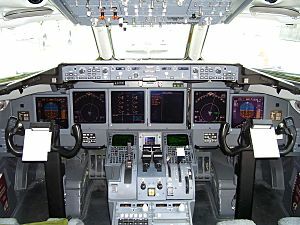 The MD-90 was longer and had a glass cockpit. It also had new IAE V2525-D5 engines. Only 117 MD-90s were made. In early 1994, the MD-95 was designed by McDonnell Douglas. The plane was 119 ft 4 in (36.37 m) long and it had a wingspan of 93 ft 5 in (28.47 m) span. 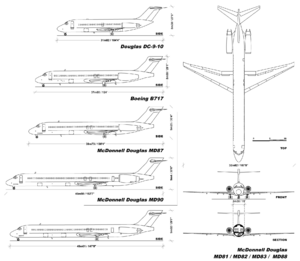 McDonnell Douglas said that it thought the MD-95 would become a family of aircraft. The MD-95 was made to replace the DC-9. The MD-95 had new engines, cockpit and it was more modern. Scandinavian Airlines System (SAS) decided to use the Boeing 737-600 instead of the MD-95 in March 1995. Then in October 1995, ValuJet bought 50 MD-95s. McDonnell Douglas thought that starting to make the MD-95 after this small order would be fine. The ValuJet order was the only order for the MD-95 for two years. The MD-95 was supposed to have a type of JT8D-200 engine. It could also have had the Rolls-Royce Tay 670. McDonnell Douglas said that the MD-95 would not cost much to make, because it was so similar to the MD-90. McDonnell Douglas thought that the BMW Rolls-Royce BR700 engine was better than the others, so on February 23, 1994, it was chosen to be the plane's engine. McDonnell Douglas was going to made all MD-95s in China. However, in 1994, McDonnell Douglas began to look for a cheap place to make the planes. Halla Group in South Korea was made the wings of the plane, Alenia of Italy made the fuselage, Aerospace Industrial Development Corp. of Taiwan make the tail; and a part of Korea Air Lines made the nose and cockpit. An AirTran Airways Boeing 717-200 in 2006. After Boeing bought McDonnell Douglas in August 1997, many people thought that Boeing would cancel the MD-95. However, Boeing decided to keep making it, but call it something else: the Boeing 717. A United States Air Force plane was called the "717-100" and the airliner was called the "717-200". The lack of a widespread use of the 717 name left it available to rebrand the MD-95. At first, Boeing was not very successful at selling the 717. The first Boeing 717s began to be made in May 1997. A small Australian airline bought many 717s, but it was eventually merged with Qantas. This meant that Qantas had some 717s that it did not want. However, Qantas soon saw that the 717 was quite good. It was bigger and faster than the BAe 146, which Qantas was using at the time. It was also cheaper to use. Many airlines which used the 717s, including Qantas, began to buy more. Qantas bought more 717s, as well as Hawaiian Airlines and Midwest Airlines. The 717's main rivals are the Airbus A318 and the Embraer E-195. 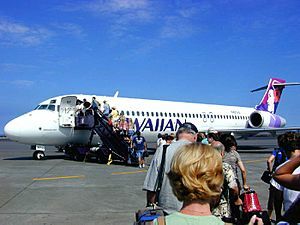 A Hawaiian Airlines 717 at Kona International Airport, Hawaii in 2004. In December 2003, Boeing lost a US$ 2.7 billion contract from Air Canada. Air Canada bought the Embraer E-Jets and Bombardier CRJ instead of the 717. In January 2005, Boeing said it would stop making the 717 after the last planes had been built. The last 717 was finished in April 2006 for AirTran Airways. AirTran got the first and last 717. The last two Boeing 717s were for AirTran and Midwest Airlines. They were delivered on May 23, 2006. The 717 was the last airliner made at Boeing's Long Beach factory in California. The 717 has a glass cockpit. The cockpit design is called the Advanced Common Flightdeck (ACF). The MD-11 has the same one. The 717 can make Category IIIb ILS landings. The 717 has the same type rating as the DC-9. This means that pilots of the DC-9 can also fly the 717. McDonnell Douglas does not have airstairs at the back of the plane. This was done so that the plane would use less fuel. MD-95-30: The first type of plane. MD-95-30ER: Could fly for longer and carry more fuel. MD-95-50: A bit bigger and could carry more passengers. Boeing 717 Business Express would have been a type of 717-200 to be used as a private jet. This version is made with the BBJ family. Boeing 717-100 (-100X): A smaller version with 86 seats. It was cancelled in 2003. Boeing 717-100X Lite: A smaller version with 75 seats. It would have had Rolls-Royce Deutschland BR 710 engines. It was cancelled. Boeing 717-300X: The other name for the MD-95-50. Delta Air Lines, Iberia and Northwest Airlines were said to be interested in this type. In July 2012, 143 Boeing 717-200s were being used. 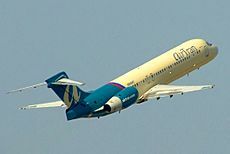 The airlines using it were Southwest Airlines (88), Hawaiian Airlines (18), Cobham Aviation Services Australia (13), Blue1 (9), Volotea (9), and Turkmenistan Airlines (6). Delta Air Lines will get 88 717s from Southwest Airlines in 2013. As of March 2009, the Boeing 717 has had five accidents. Nobody has died in these, and there have been no hull-loss accidents. A hull-loss accident is an accident where the plane is damaged so much that it cannot be repaired, or if the plane is completely destroyed. The Boeing 717 was manufactured at the company's facility at the Long Beach Airport, California. Boeing 717 Facts for Kids. Kiddle Encyclopedia.